Destined to become every baker’s favorite cookbook, Sweet is filled with beloved recipes from Los Angeles baker Valerie Gordon. The author re-creates desserts from Los Angeles’s lost restaurants, perfecting classic favorites like petits fours, cakes, and cookies with the addition of candied rose petals or matcha tea—and she even provides an accessible way to mix and match components so readers can design their own luscious cakes and pies. 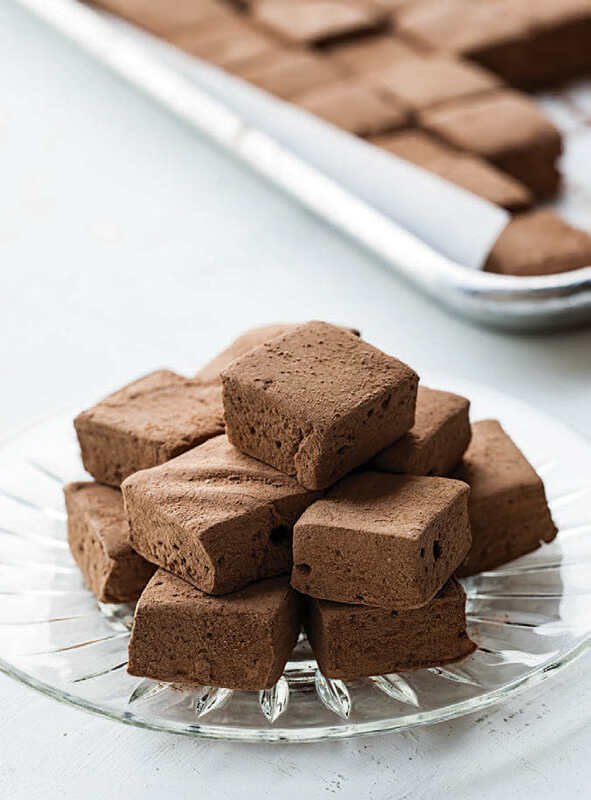 From Sweet, here’s a recipe for chocolate marshmallows that will add a dose of comforting decadence to your holiday libations. 1. Spray a 9–by-13-by-2-inch baking sheet with nonstick baking spray or lightly brush with a neutral oil such as canola or grapeseed. 2. Pour 1/2 cup of the water into the bowl of a stand mixer fitted with the whisk attachment. Add the gelatin, stir to combine, and allow to soften, about 3 minutes. 3. Meanwhile, combine the remaining 1/2 cup water, the sugar, corn syrup, and salt in a small saucepan and heat over low heat, stirring, until the sugar is dissolved, about 3 minutes. Attach a candy thermometer to the side of the pan, increase the heat to medium, and bring to a boil, without stirring. Keep a wet pastry brush handy, and brush down the sides of the pot if little crystals appear. When the temperature reaches 240°F, remove the pan from the heat. 4. Turn the mixer onto low speed and slowly pour the hot sugar mixture into the gelatin. Gradually increase the speed to high and beat until the mixture is opaque and thick, about 12 minutes. 5. Add the vanilla and chopped chocolate and beat on medium speed until thoroughly combined. Immediately transfer the marshmallow to the prepared baking sheet and spread it evenly with an oiled offset spatula. Cover the marshmallow with a piece of parchment and set aside until firm, about 2 hours. The marshmallows can be stored in an airtight container for up to 3 weeks. Marshmallow image by Peden + Munk. Want more recipes like this? Sign up for the Artisan Cookbook Club newsletter here.